Easy and powerful wireframe design maker. SmartDraw is an effective wireframing tool for creating enhanced designs.This software can import and export stencils in Visio format where it’s new version makes the transition easy for the user.It is compatible with many third-party integrations and can run on all OS platforms.In addition, it has rich contents such as 4,500 templates and 34,000 symbols that you can use to create professional designs.It also has a powerful automation, which makes designing easier for you.SmartDraw provides high security to your files and it is available in multiple languages in order to support global users.It is a cloud-based solution that provides enterprise-quality license administration tools. How much does SmartDraw cost ? 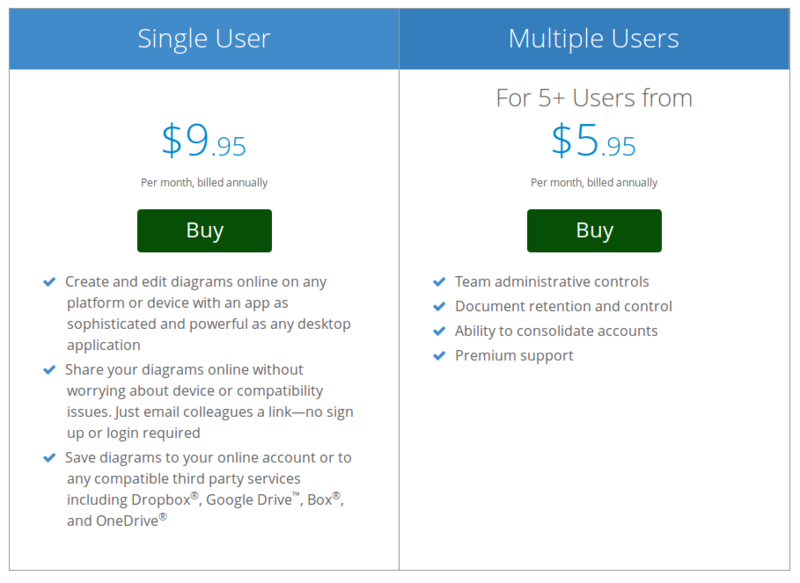 The pricing for SmartDraw starts at $5.95 per user per month. SmartDraw has 4 different plans such as - Multiple User at $5.95 per user per month, Single User at $9.95 per month, Single user Desktop at $297.0 and Multi-user Desktop at $595.0 per year. SmartDraw also offers a custom plan based on the customer's request. $9.95 Per User Per Month Billed Annually. 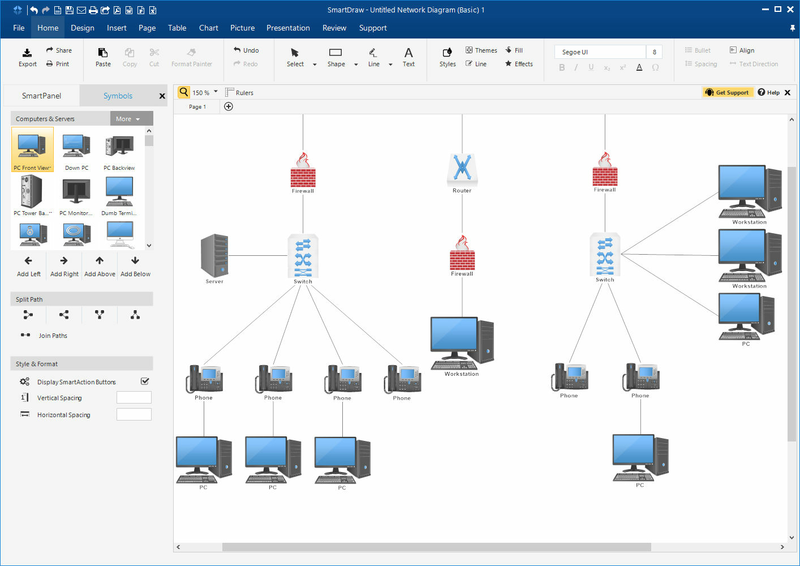 Create and edit diagrams online on any platform or device with an app as sophisticated and powerful as any desktop application. 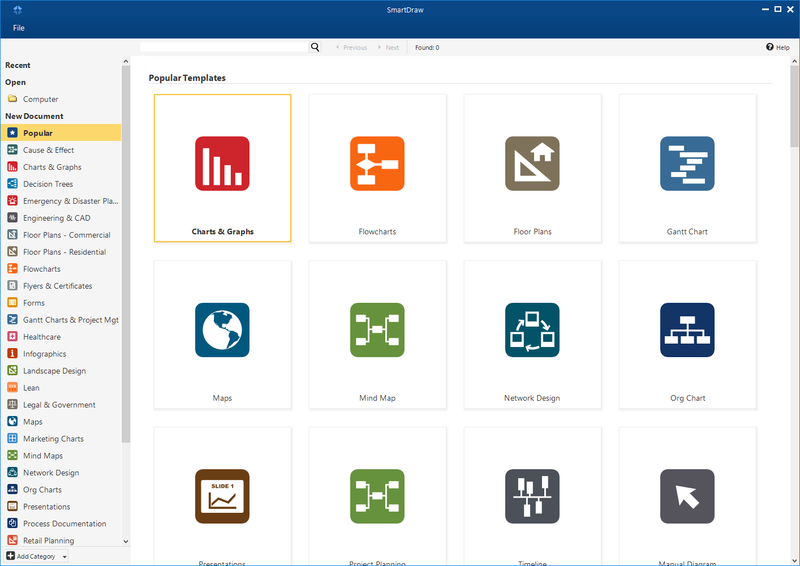 Share your diagrams online without worrying about device or compatibility issues. Just email colleagues a link—no sign up or login required. Please Contact the Vendor for a Detailed pricing Information. "Smartdraw is the perfect program for simple submittals"
I like the ease of use. This product gives me just enough options to get the job done without over complicating things like CAD tends to do. Sometimes there is issues getting the lines to snap together correctly. This happens when drawing walls using the auto-snap feature. It seems like it is a little too magnetic at times and the only alternative is turning it off completely. We are able to quote smaller jobs quickly and easily without getting into the woods of auto-cad. This increases productivity and turn around time on smaller projects which increases our overall volume of projects completed. It's user friendly and can self teach . 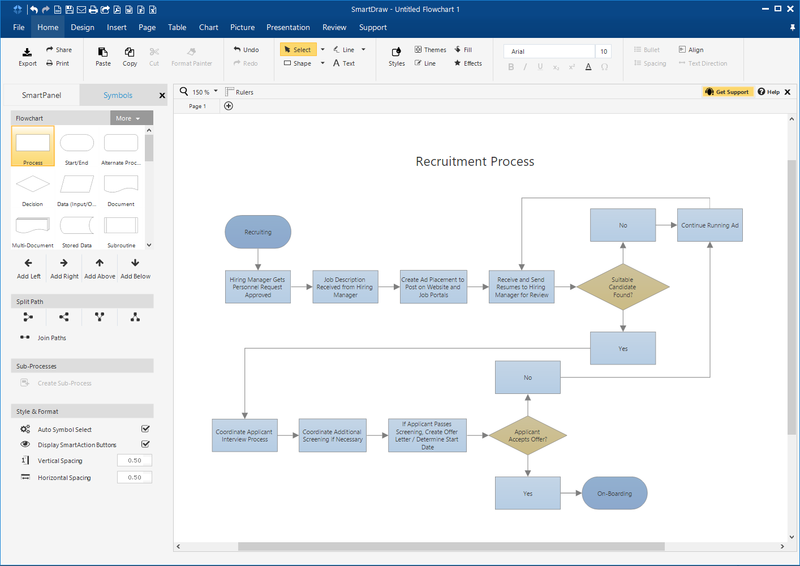 "SmartDraw has a beautiful UI"
"Excellent visuals to present planning and implementation "
The range of options and templates to use when creating diagrams is great! This allows us to streamline our processes and get work done quickly. It can hog resources, so older machines can slow down when using it. Being able to create diagrams and visual components to presentations has been a real boon to us! "I worked perfectly in the creation of mental maps." Use the free version and I was able to design mental maps to fulfill the academic assignments in my school. It is an easy-to-use program, it is innovative in editing these types of diagrams. It allows the creation of many types of diagrams, in my case use only mental maps and task planning diagrams, better known as Gantt diagrams. When trying to capture all the planning for a year of a fictional project, I had problems because the diagram was so wide the columns were difficult to visualize and adjust to a better size. However, with the mental maps, I do not complain because its editing was very simple and I was able to translate my ideas as I had thought to do. In the disadvantages I could mention that I do not like it to be paid. And it would be great to have its downloadable version. I insist that it is an application software for many academic, professional and personal needs, of any idea there is a good representation through diagrams, and this is precisely the specialty of Smartdraw, it allows us to translate our ideas through diagrams. The tool is very powerful so I recommend it to my colleagues and professors alike. It is a very beneficial application because it allows the edition of diagrams for professional, academic and personal use. It is one of those basic applications that we must have in our computer. The infographics/charts/graphs are all very high quality. Many to choose from. If you're looking to put someone together with very little time, then this software is for you. Infographics come basically made to print. There really isn't that much to choose from when you get down to it. Yes there is a lot there but many of the graphs are so specific that I could never see myself ever having use for them. I also found that the graphs are so specific that customizing them is extremely hard. There were also many issues with choosing colors, margins, and text. I hate how it doesn't do spellcheck and how hard it is to find icons. smart draw is easy to use and doesn't take long to learn how to use it. It is a product that can be used by a person beginning in CAD systems to do simple drawings and learn to draw simple floor plans for a project they might be doing. It is great to be used in a home setting by someone who wants to draw up their own house plans. This would also be great if you were designing something that you wanted to take and have someone else build for you. The product have useful help features and also has a good library of furnishings to show in the floor plan to help indicate size or scale. I have used these features to to show subs a floor plan so they can provide pricing for me on my design build projects. This has proven very useful since the subs cant always go to the job site to do their own measuring of the space. I can also provide photos of the space to go along with the floor plan so they can see. smart draw is limited in functionality meaning it doesn't seem to have more advanced features. This is a good tool for simple drawings but I wouldn't recommend it for an architect firm. 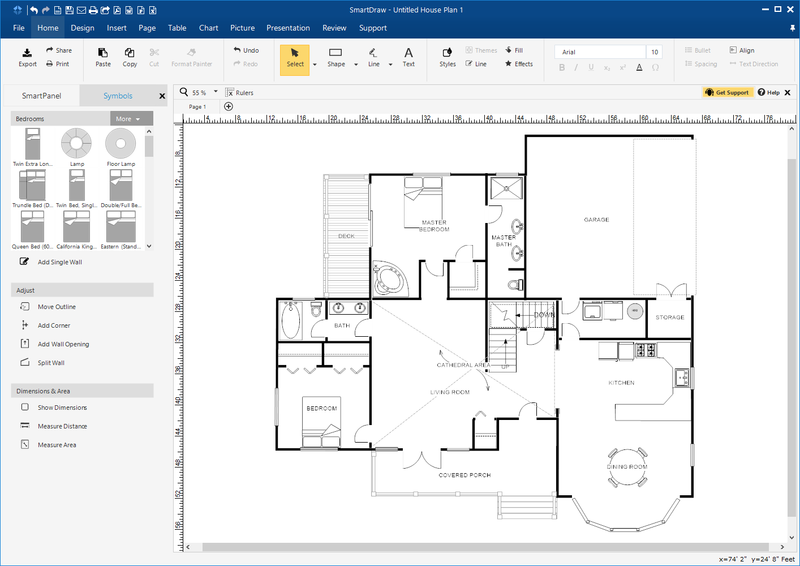 I use smart draw to draw basic floor plans for my design build projects so I can get basic concepts to subcontractors and fill in missing information. Its so easy to use and has so many options to pick from. Even does some project Gantt style charting. Well i found the way its priced to be good but i had to get a lot of seats to make it worth it. Try it out before you buy, but you will want to buy it. The timelines are a bit difficult to work with. Sometimes the bubbles take on a mind of their own and don't let you move and manipulate them easily. absolutely impressive,all in one that includes scales,infograph and report presentation templates .even 100 of floor plans are there .makes things really easy.give it a try!